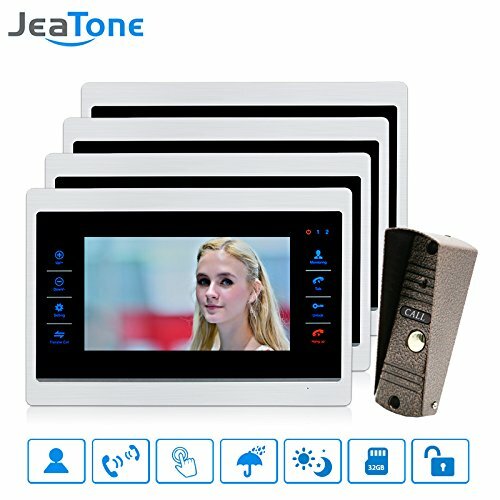 Video and Audio Chat, Dual-way intercom,Adjust Lock Time,Compatible with all electronic lock.3 mode sound volumn(Rest/work/jollification mode), There is a flexible option of setting the volume from mute and up to 10, making it convenient for night time. Support pictures/video record, up to 32GB TF card (Not Included),Build-in Memory can save 86 pictures. Outdoor doobell camera:1⁄3” COMS,2.8mm Wide-angle lens,1200TVL,IR day/night vision,Metal material&waterproof.